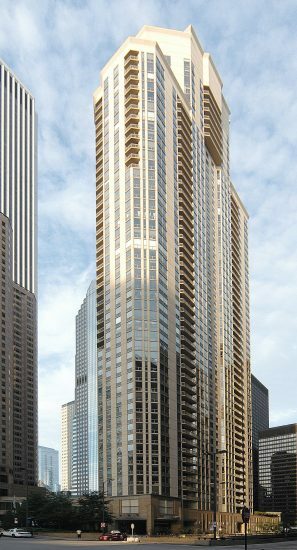 This 57 story luxury rental high-rise is situated in Chicago’s New East Side and offers 480 studio, i, 2 and 3-bedroom units. Residential facilities include a library and business center fashioned in rich decor, a fitness center and spa including an indoor lap pool, whirlpool, steam and sauna, an outdoor terrace and Internet cafe. The grand lobby entrance compliments the residences which feature granite islands, maple cabinetry, luxurious wall-to-wall carpeting and spectacular views of the lake and city from private balconies. Retail facilities include a dry cleaners and Bockwinkel’s grocery.